Severalnines is excited to announce its newest customer Verisec AB, an international IT security company on the cutting edge of digital security, creating solutions that make systems secure and easily accessible for industries like banking, government and businesses worldwide. 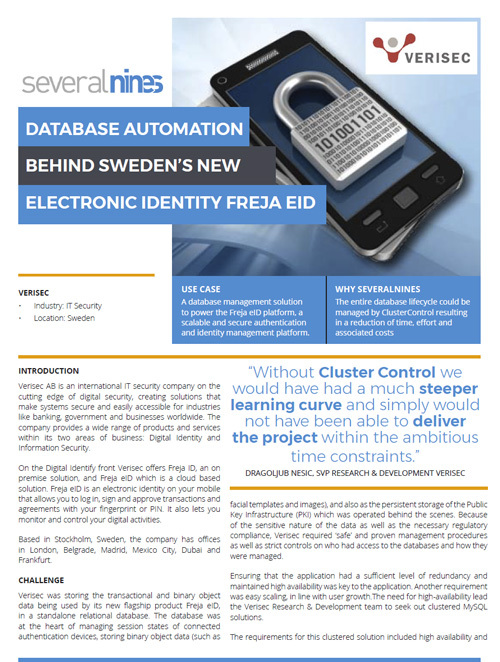 Verisec is the creator of the Freja eID platform, a scalable and secure authentication and identity management platform. It provides electronic identities on mobile phones, that allows users to log in, sign and approve transactions and agreements with fingerprints or PIN. It also lets users monitor and control their digital activities, which helps avoid ID theft and fraud. 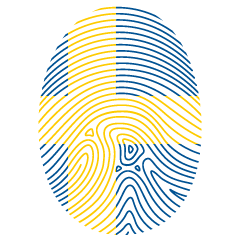 The eID is officially approved by the Swedish E-identification board with the quality mark “Svensk e-legitimation”. In the case study, you can learn how the sensitive nature of an identity service raises the bar on the underlying data management - from regulatory compliance, security, and tight SLAs with resolution of service interruptions or performance problems within narrow time windows. In addition, the case study will show how Verisec’s entire lifecycle could be automated via ClusterControl. ClusterControl is the all-inclusive open source database management system for users with mixed environments that removes the need for multiple management tools. ClusterControl provides advanced deployment, management, monitoring, and scaling functionality to get your MySQL, MongoDB, and PostgreSQL databases up-and-running using proven methodologies that you can depend on to work. At the core of ClusterControl is it’s automation functionality that let’s you automate many of the database tasks you have to perform regularly, like deploying new databases, detecting anomalies, recovering nodes from failures, adding and scaling new nodes, running backups and upgrades, and more. Severalnines' products are used by developers and administrators of all skills levels to provide the full 'deploy, manage, monitor, scale' database cycle, thus freeing them from the complexity and learning curves that are typically associated with highly available database clusters. Severalnines is often called the “anti-startup” as it is entirely self-funded by its founders. The company has enabled over 12,000 deployments to date via its popular product ClusterControl. Currently counting BT, Orange, Cisco, CNRS, Technicolor, AVG, Ping Identity and Paytrail as customers. Severalnines is a private company headquartered in Stockholm, Sweden with offices in Singapore, Japan and the United States.